Just this last weekend I had a makeup job at a wedding and one lady I had in my seat was absolutely thrilled with her makeup. I asked her if this was the first time she had her makeup applied by a professional makeup artist and she began to tell me about a horrible experience she had with her bridal makeup for her special day. Without going into detail I really couldn’t believe what I was hearing. To make a long story short she told me that her wedding pictures were so bad that she had the photographer touch up almost every photo she wanted to purchase. She said that her face looked like a ghost compared to the rest of her. I would imagine that her foundation was too light for her especially when a flash hits the skin. The makeup artist should have matched the foundation to her chest, I’ve seen this time and time again in photos where the face doesn’t match the neck and chest. She told me she went to a department store to get her makeup done. Now I’m not saying there is anything wrong with this. There are some wonderful makeup artists working in retail who truly do know how to apply makeup for photos. Of course on the other hand there are many who do not. This is why I strongly suggest when looking for a makeup artist for your wedding day make sure you see their portfolios and look for things like makeup up being too light, unbalanced eyes, cheeks, lips not looking even, eyebrows not looking even, eye makeup not balancing, etc. Photography ladies is not forgiving. Yes there is Photoshop but do you really want your lasting memories all touched up instead of the real you coming out on such an important day. 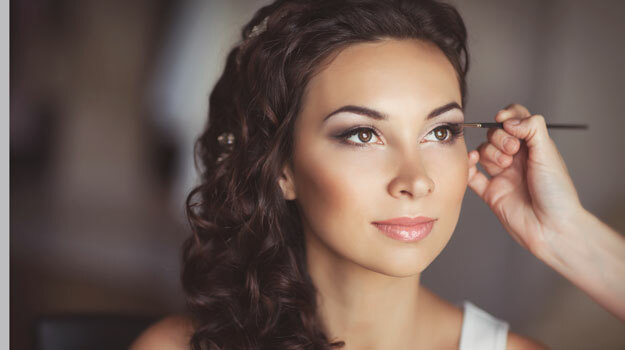 I know from experience that a lot of brides are not too eager on spending money on the makeup. After all the other expenses it just seems like a lot of money but it’s likely one of the the smallest expenses you will have for your wedding day. And really what do you have after the wedding. A wedding dress that you will never wear again and your pictures. Don’t you want them to be the best they can be? Lasting memories is all you have left and that being said don’t you think you should invest in a good makeup artist? Please do yourself a favour and go for a little extra expense when it comes to your makeup application. Compared to the other costs the makeup is really the cheapest thing you’ll be paying for.